Inspired by a live recording of a Sacred Sound Journey at the Yoga Barn, Ubud, Bali with Dr Didge Dolphin (didgeridoo, drums, sticks and flute), ShamanaTara on vocals and Shervin Boloorian on sacred instruments, accompanied by majestic humpback whale song. We made this music as an offering to Shiva/Shakti to God/Goddess our Father/Mother God. It arose from our love and is our humble offering to God and each other. We believe this music balances the masculine and feminine in all. This sacred sound experience will promote and accelerate healing of the mind and soul. Recorded with 12 tuned didges from low A to high G. It has been made with an intent to heal. 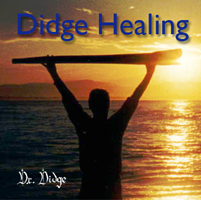 Didge Healing is an exploration through 12 different keyed didgeridoos, A-G# and their corresponding subsonics. Relax, breathe and enjoy the ride. Dr Didge Dolphin.